Product 101 – Conditioning Treatments…to heat or not to heat. Today’s tale is the next chapter in my Product 101 series. My focus today is on Conditioning Treatments. Everywhere you look…facebook, twitter, pinterest and the ever impressive infomercials, everyone has the “best conditioning treatment EVER!”. This may be true. 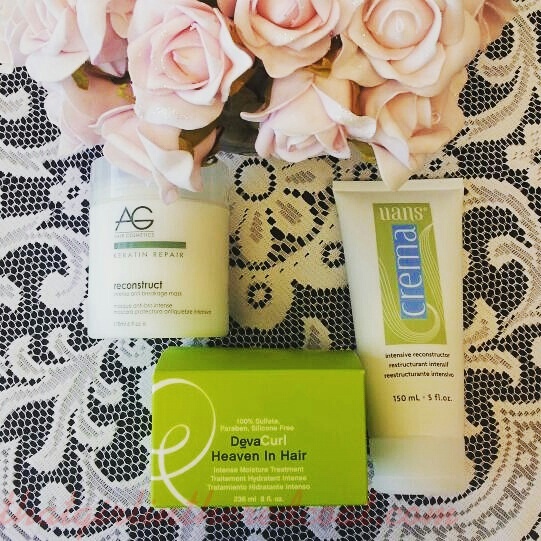 What I also know to be true is that all Salon Professional Hair Care lines offer a conditioning treatment and depending on your hair type and hair diagnosis, it very well could be the “best EVER!”. Not all conditioning treatments are created equal, just as every head of hair is not created equal. Some of us have dried, stressed strands due to chemical damage…demanding to go from brunette to blonde in one sitting. Others due to mechanical damage…forgoing a flat iron spray to protect our tresses with our daily rendezvous with our flat iron. Some of us are facing dry, lack of lustre hair due to good ol’ DNA. Whatever the reason, we all deal with dry, stressed hair, and this is when a conditioning treatment can become your new best friend. Being me, I have compiled a little list. A “things to remember” list, if you will. Feel free to share. – Conditioning Treatments are created to repair your hair, by saturating the cuticle & cortex with moisture, which in turn adds moisture back into your hair, adds elasticity and strength, and restores shine and lustre. – not all conditioning treatments are created for all hair types. Read the label. – too much protein/keratin in the hair is just as bad as not enough. Always follow the directions of the conditioning treatment. If it is to be used only once a week, only use it once a week. *too much protein/keratin = fuzzy head (not a professional term, but it works). – after 20 minutes, most conditioning treatments have done all they can do. You can wrap your head in a towel overnight if you so desire. I myself prefer a comfortable slumber. – not all conditioning treatments require heat. Using heat with a conditioning treatment that does not require heat can result in greasy strands and/or lifeless tresses. …and being me, here are some conditioning treatments that have been tried and tested by yours truly and our Salon/Shop clientele. No heat is required for these gems. 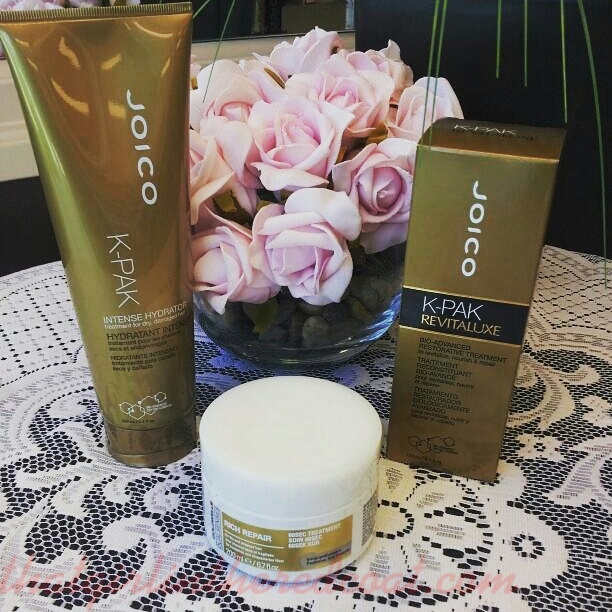 Joico Kpak Revitaluxe – the newest addition to the Kpak treatment family. This gem restores the level of the hair’s porosity, adds moisture and detangles. It doubles your hair’s resistance to future breakage by up to 94%. Kpak Revitaluxe is created for all hair types – strong enough to penetrate the thickest of strands, yet light enough not to weigh down baby fine strands. For best results, apply to freshly washed hair and leave on for 3-5 minutes, then rinse. *this gem is one of the reasons this Girl in the Red Coat can be a blonde. Joico Kpak Intense Hydrator – the name says it all. This treatment offers immediate hydration to the driest of strands and is created for all hair types. For best results, apply to freshly washed hair and leave in for a full 5 minutes, then rinse. Goldwell Rich Repair 60sec treatment – yep! you read that correctly. 60 seconds. That’s all you need. This treatment will regenerate your hair up to 100% in 60 seconds. It restores the damaged hair structure from the inside out while providing softness and shine. Created for all hair types. *for finer strands, less is more. If you like to heat it up – these are for you. AG reconstruct – reconstructs extremely dry, damaged hair while rejuvenating the scalp. AG reconstruct is paraben free, gluten free and contains no salt. They are a cruelty free Canadian company. Apply to freshly washed hair, leave in for 2-5 minutes, then rinse. *to create a more intense treatment, apply heat for 20 minutes. UANS CREMA Intensive Reconstructor – a self sealing conditioning treatment that adds moisture and restores elasticity. It can be used once a week, or as often as needed. Apply to freshly washed hair, leave in for 2-5 minutes, then rinse. *to create a more intense treatment, apply heat for 5 – 10 minutes. DevaCurl Heaven in Hair Treatment – an intense moisture treatment for all curl types that is silicone free, paraben free and sulfate free that can be used once to twice a week. With this gem, more is best. Apply to freshly washed hair, apply a liberal amount and leave in for 15-20 minutes, then rinse. * for best results, once the treatment is applied, place hair under a plastic cap and apply heat. In the age of Ombre, Sombre, Balayage, Brazilian BlowOuts and daily use of thermal styling tools, conditioning treatments are a must have. Not only will your hair look and feel fabulous, you are protecting your investment in yourself and you are ensuring that your hair stays in optimal shape and condition for further color, chemical and thermal adventures.